I woke early, two minutes before my alarm was set, like my body already knew it was time to move. I got my gear together and headed out the door to meet one of the groups I hike with (TLC) to take on Robbers Roost in the Superstition Mountains. This trek was a 7.5 mile loop starting at Lost Goldmine Trailhead traversing Lost Goldmine trail passing Cerney Spring Trailhead then ascending up West Boulder trail. Once up top we will cut across Dacite Mesa (with a quick break at Robbers Roost of course) to Fremont Saddle where we descended Cave Trail connecting into Bluff Springs Trail which ends at Peralta trailhead, just a short 0.5 mile walk from Lost Goldmine Trailhead where we parked (whew was a mouthful). The initial ascent up West Boulder Trail is a killer grind which leaves you sweating and breathless. Breathless not only from the laboring climb but from the views of the surrounding canyon! Hoodoos and jetting spires, rock formations and cacti everywhere, it is truly a sight that must be seen. Once we were up top, we skirted north east on Dacite Mesa Trail through the boulders and spires along gorgeous scenic views of the valley below. Trekking along we came upon Robbers Roost, which is a short jaunt off trail that makes you feel like your attempting to hike down off one of the canyons. 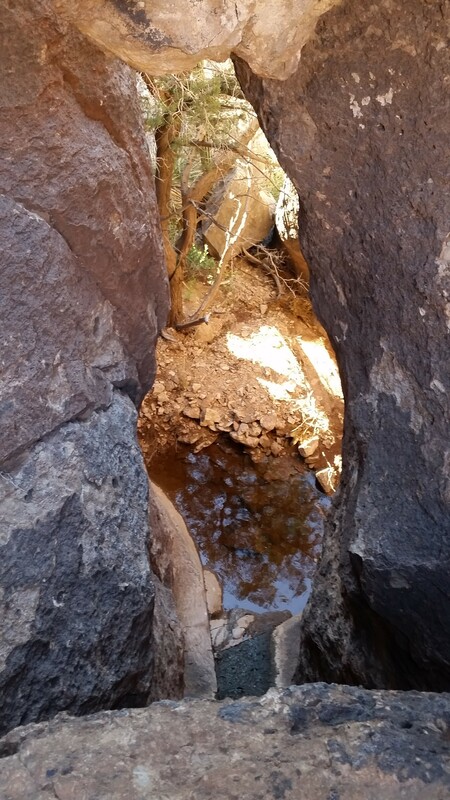 This hidden gem has huge protective rock formations and a small spring that could supply water if you were in fact held up here. One of the rooms that are inaccessible except by repelling gear had a pool of water and a lush green tree growing up through it, truly a hidden oasis. Hiking back up top we skirted the mountain until hitting Fremont Saddle. Every time the trail would twist or turn popping over a ridge, there was a new miraculous view waiting to be glimpsed. 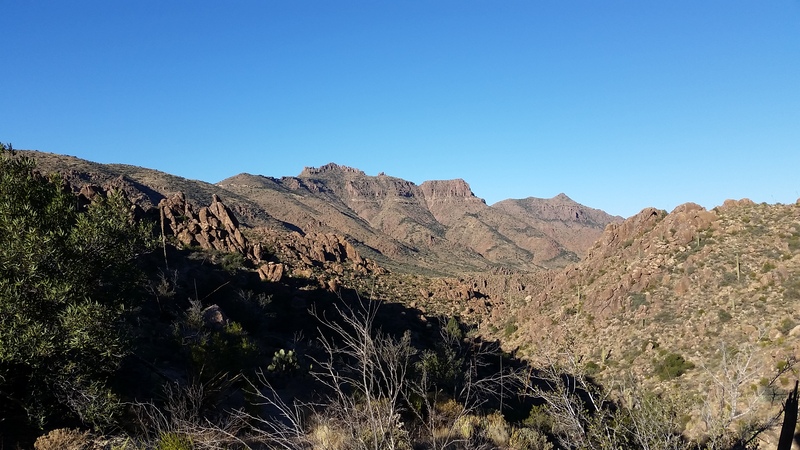 We bombed down from the saddle on Cave Trail which proved to be a scramble, boulder hopping, cairn (small stacks of rocks marking the trail) finders paradise! A few points along the way gave us the present of exposure with sketchy down climbs! The whole crew toughed through and trekked on tying back into Bluff Spring Trail and back to the road which lead to Lost Goldmine Trailhead. Back to the cars from another successful day trek we said our goodbyes and headed back home. 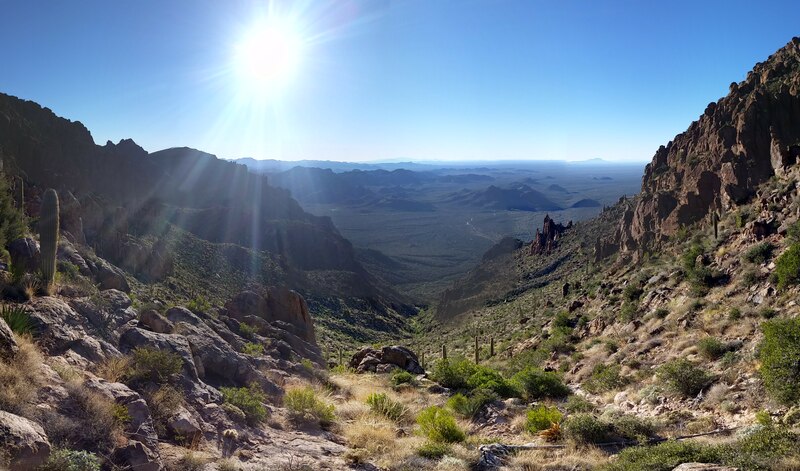 Man what another awesome adventure, the Superstition Mountains never seize to amaze me. The seclusion, the beauty, the abundance of expansive vast views, and of course the toughness of the trail always keep me coming back for more. Until next time. Almost back to the trailhead! The Grand Canyon is one of my favorite places to hike in Arizona. Yes there are a ton of tourists, the corridor trails aren’t very technical, and the mule trains smell horrible, but the indisputable beauty of this vast, incredible chasm overwhelms any con you could come up with. I planned this hike as an overnight backpacking trek. 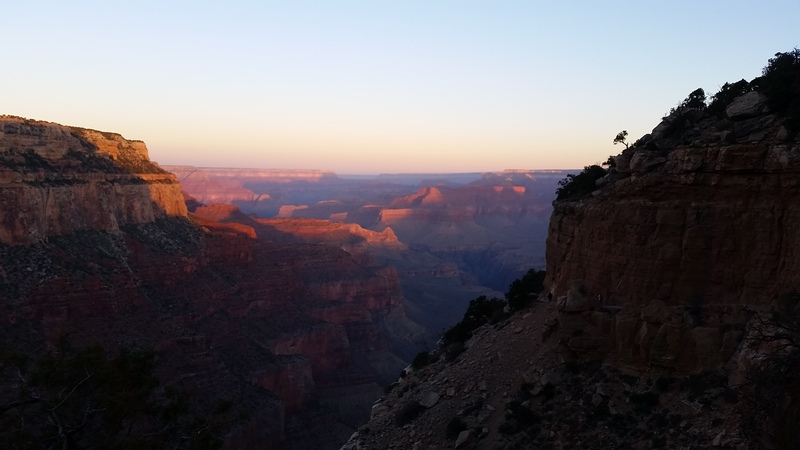 Down South Kaibab, ascending North Kaibab, and camping on the North Rim with some new friends would conclude my first day. The next day would consist of diving down North Kaibab, up and out Bright Angel trail, and a “short” drive back to Phoenix. 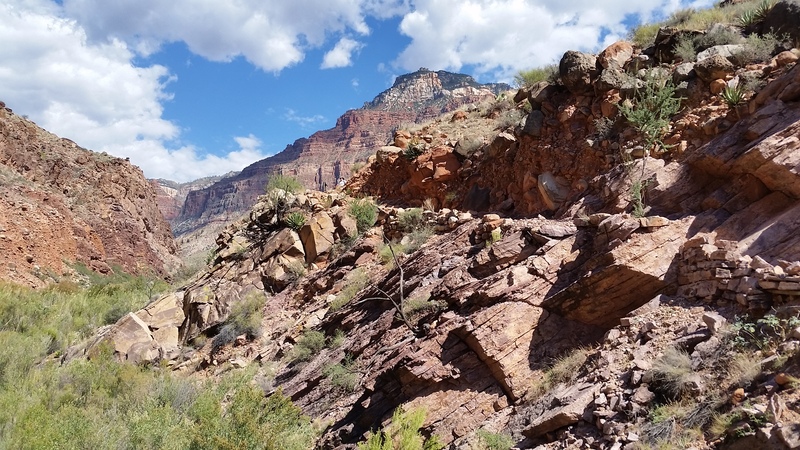 I always mentally divided this trek into 3 sections: the initial dive off the South Rim to the Colorado River, the long flat through the box and open desert to Cottonwood campground, and finally the long ascent through the red rock up to pines and the North Rim. Being full of energy and excitement that morning and looking at the canyon in the morning light made the first section fly by. Before I knew it I was at Phantom Ranch, putting my feet up having a snack, and chatting with the other hikers who were breaking there. There is a small store there where you can pre-order meals and get fresh lemonade. 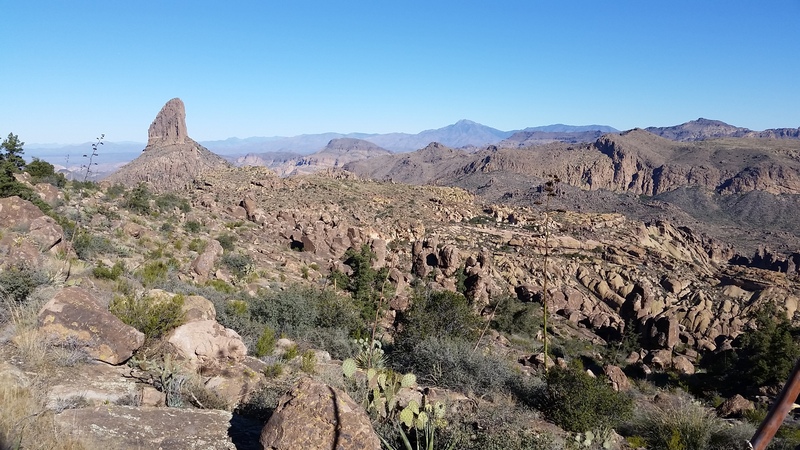 After taking a quick break at Phantom Ranch, checking my water, and filling my appetite on Clif Bars and Pringles, I packed up and headed into “The Box”. In this section, the canyon walls came in close as I hiked along the Bright Angel Creek running down from Roaring Springs. In the summer this stretch of trail is absolutely relentless, and the heat beams off the rock walls like an oven. On an October morning, however, this wasn’t a problem. Once the canyon walls opened up, and it became more apparent I was in desert landscape, I knew I was out of “The Box”. Half way between “The Box” and Cottonwood campground there is an oasis waterfall called Ribbon Falls, this is a must see! I walked into the small canyon that housed the fall and could instantly feel the air become cooler. Once reaching the falls, I took no time pulling off everything but my boxers and went for a refreshing dip in the crisp clean clear water, which totally rejuvenated my feet from any soreness they had accumulated. Little moments like these make hiking so worth it! Before long I threw my gear back on and trekked on towards Cottonwood campground. Once I reached the campground, I checked my water, had another quick snack, and wasted no time heading out up towards the North rim. 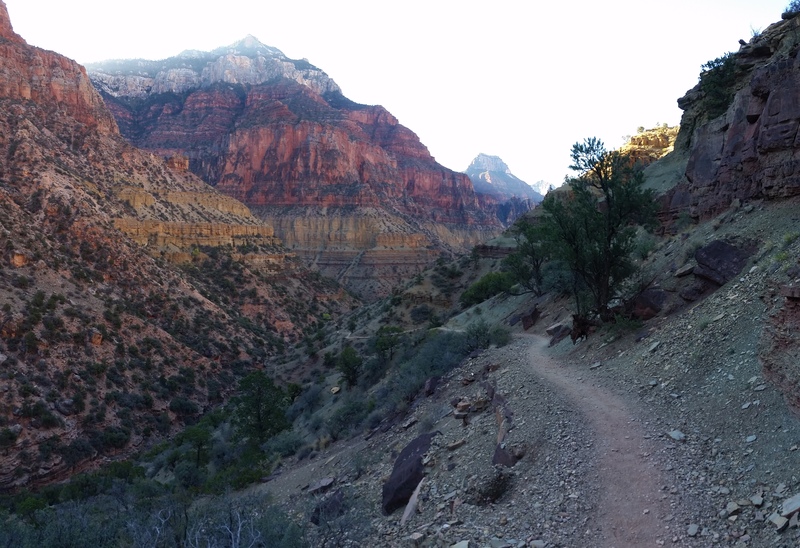 This is by far my favorite section of the trail in the Canyon. The combination of red rock canyon walls, cool temps, vast drop offs that guard the trails edge, pine trees, and afternoon light make this area very special. 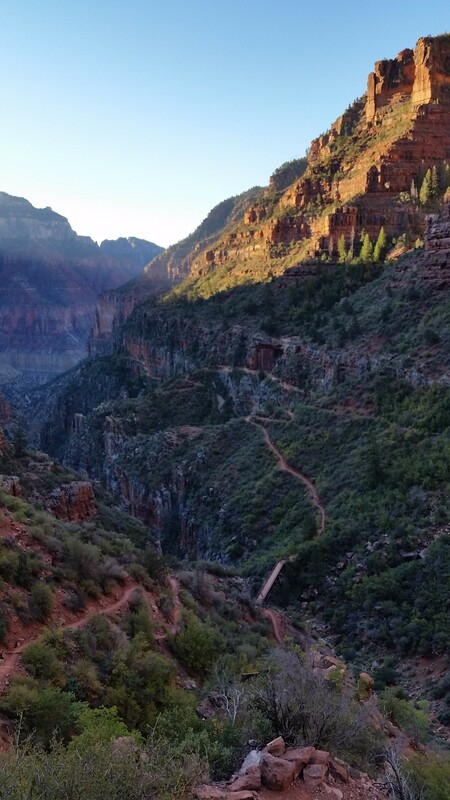 Soon I was sweating, breathing heavily, and laboring the last few miles just before the North Kaibab trailhead. The last few miles are the most vertical, and of course to make things more difficult, the trail turns to sand from constant trample of mule trains (which leave nice steaming presents for you to smell as you’re sucking wind). 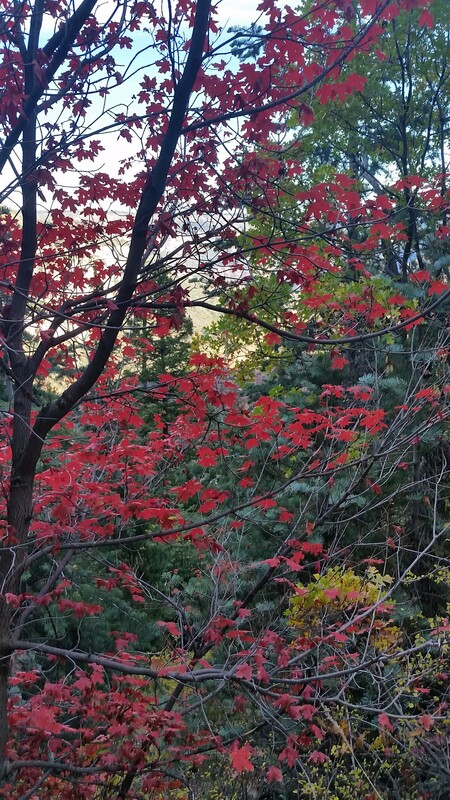 Even though this is a tough part, you’re rewarded with gorgeous views of changing leaves and pine trees growing from the immense rock faces surrounding the trail. I pushed hard to finish out from beneath my bulging backpack. All of the sudden, I felt a strange sharp pain starting in my lower quad at the knee walking its way up my leg. After a few seconds I knew it was a cramp. My left leg followed suit and soon mirrored the pain I felt in the right. I had no salt tablets and I was only a few switchers from the exit. I pressed on knowing I could borrow some electrolytes from another hiker. I finally reached the trailhead surprised to hear a crowd waiting and cheering on exiting hikers. It didn’t matter if they knew you or not, they were there for moral support. I almost forgot about the seizing pain in my legs. After a sharp reminder I hurriedly dumped my pack and found a fellow hiker with a salt packet. The salt and a gulp of fresh water quickly alleviated the pain. This was my first time experiencing cramps in my legs. Soon after I reached the rim, my friends exited. We went to the campground to set up camp and a quick jaunt up to the North Rim Lodge to grab some food and beer before crashing for the night. It’s always great to swap stories with people who enjoy the same things you are passionate about. Time to head back across! The next day I woke early for the return trek. I ate breakfast, threw my pack on, and said farewell to my friends before I bombed off once again into one of nature’s most incredible wonders. Pictures don’t do it justice and stories can only tickle curiosity. I urge you to throw on a pack, get some boots, put some dirt beneath your feet and experience this place for yourself. You won’t regret it! Entering "The Box" where trees defy gravity! Early in the morning of the 5th day, I woke to a sound outside the shelter. I poked my head out of my tent and beamed my headlamp light into the darkness to see the wind blowing snow across the shelter opening. I knew it was coming, I just wasn’t sure how much would accumulate on the trail before I started trekking. I pulled my head back into the tent and receded into the warmth of my bag for a few more hours of sleep before I started my morning ritual of packing up and making breakfast. Before I knew it I was sipping hot coffee, throwing on my pack, and saying goodbyes to my temporary roommate “Just Jim”. I had a little over 7 miles of the ridge roller coaster left before I would reach “The Priest” shelter and peak. The path would then take me on my final descent to the Tye River and Highway 56, where I would walk a half mile to the cabin where my family was staying. 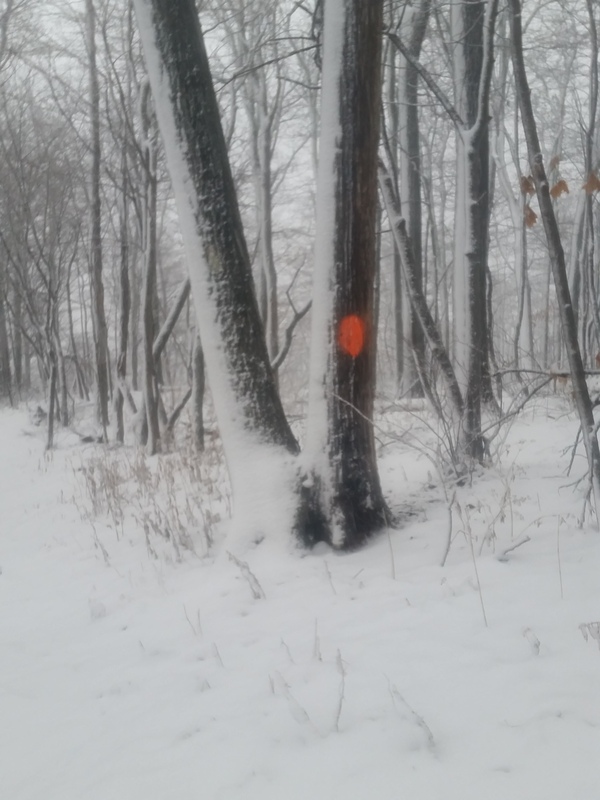 The morning was bitter cold, the kind that bites at any exposed flesh, and when I started walking there was already 3-4 inches of snow on the ground. I had my facemask pulled on tight to combat the swirling, whipping wind. The socks I had would soon be completely soaked from walking through the snow, and I knew that the only thing I could do to keep warm was to keep walking. The Merrell boots I was wearing were not waterproof, and I didn’t want to go back to the trailrunners on a big downhill and risk rolling an ankle again. 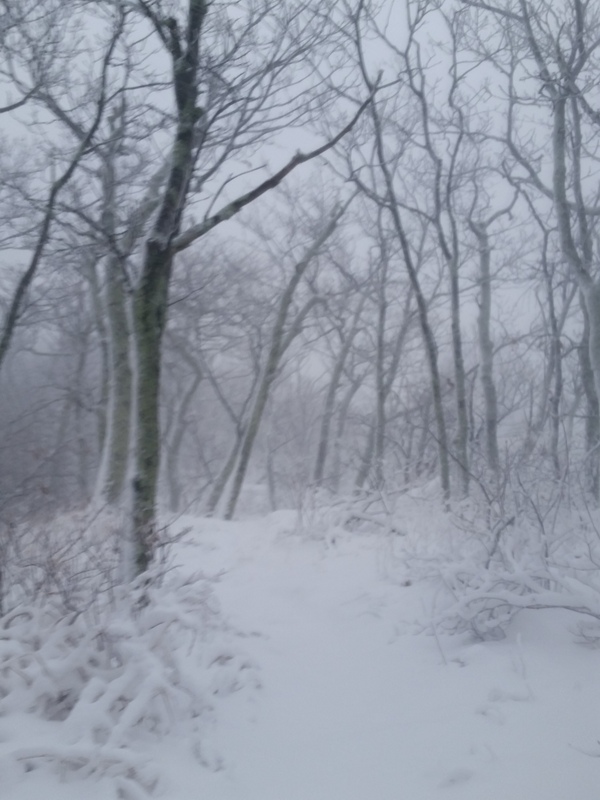 I trudged through the snow along the ridge, breaking trail as I went. Although it was cold, it was absolutely beautiful! The snow continued to fall and everywhere I looked, the landscape was covered in a perfect blanket of undisturbed snow. I trekked on stopping only momentarily to pull my hand from the wet gloves, fish out my phone, and shakily snap a few pictures before the screen became too wet to pick up my fingerprint. After a few minutes of standing still the chill began to creep on. I quickly stuffed the camera away, not knowing if the pictures I was taking were actually decent, and moved on. I finally reached The Priest and knew the rest of the trip would be a slippery downhill to the highway and eventually the cabin. (I could only speculate why they called it “The Priest”, but if I had to guess it’s because if you were climbing the opposite direction from the Tye River up to the ridge, you would need a Priest when you reached the top! Its a serious ascent!) I pressed on, seeing random rabbit and bird tracks in the snow but no sign of the creatures themselves. I came upon one expansive view on the downclimb. I looked out, attempting to peer out past the foggy morning, but was only slightly able to make out a few lakes in the distance. I had no depth perception at this point but I knew I had only a few miles left.I kept descending and as I dropped elevation the snow turned to freezing rain. The snowline was at about 1500 feet and everything below that was sopping wet. The path weaved in and out of canyons, crossing a few heavy running creeks. I turned a corner and saw an old farm house with a few sheds and old machinery in the back. I knew I wasn’t far from the road! I traversed the next few switchbacks with childlike excitement! I soon walked out of the trail and onto Crabtree Falls Highway 56, just 0.4 miles from my destination. I was hit by an overwhelming feeling that words can’t describe when I realized how close I was to finishing. I was just moments away from walking 100 miles in 5 days. I remember repeating “a hundred miles in five days” out loud to no one in particular, and every time I said it a wave of inexplicable emotion washed over me. With just this small personal accomplishment, I could only imagine what true through hikers that push 2000+ miles straight must feel when they finally reach the end of their journey. I trekked the last section along the road with ease. I reached the cabin, half expecting to see no one there. I walked to the door and knocked eagerly to see my mom soon appear in the doorway. I was so excited I threw my arms around her and half yelled “A hundred miles in 5 days!” I was drenched through from the snow and cold to the bone, but I couldn’t have been happier. It was nice to hit the mark and surprise myself. My AT trek ended there, but it is far from my last! What a wonderful journey! Favorite pic of the day – Neon Moss! The fourth day I woke surprised to find my legs free of soreness from the big miles the day before (and of course the unforgettable three ankle twists). Despite the huge dinner I ate the night before, my stomach was complaining it wanted food. “Feed me Seymour!” it seemed to shout. I went through my morning ritual; made warm oatmeal, nice strong coffee, and packed up camp. 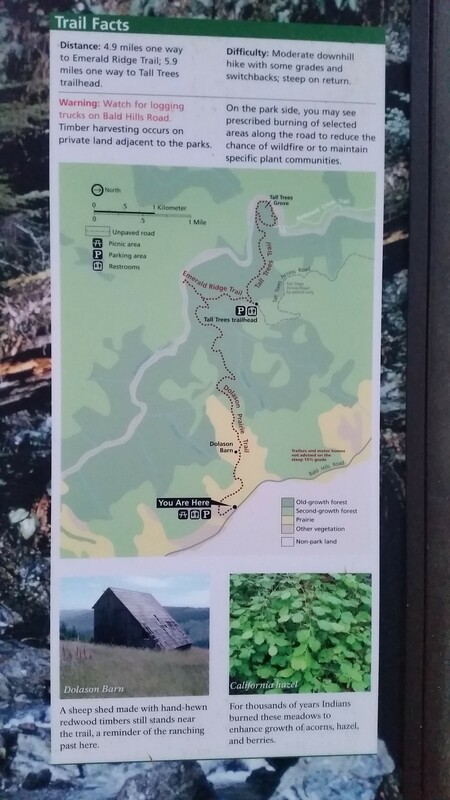 I had 24 miles to tackle from Punchbowl shelter to Seely Woodworth shelter. 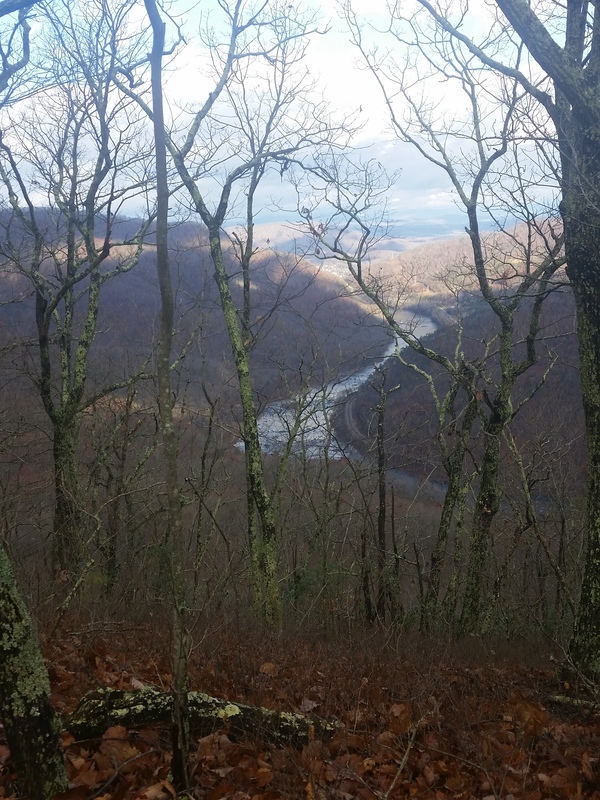 One downhill to Lynchburg Reservoir, a huge climb to Cow Camp Gap, and a roller coaster on the ridge passing Cold Mountain stood between me and my goal. 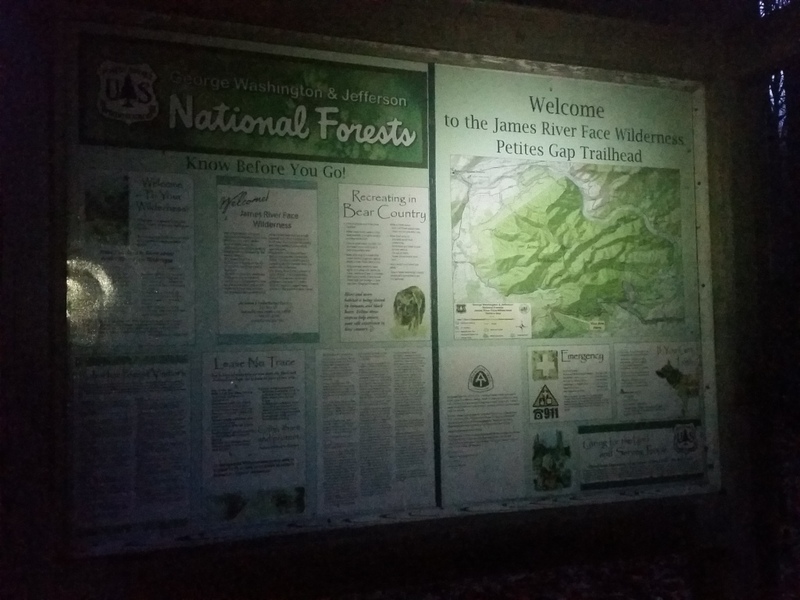 Under an hour from cracking my eyes open, I was standing on the trail, head lamp strapped on, ready to start another day in the dark. 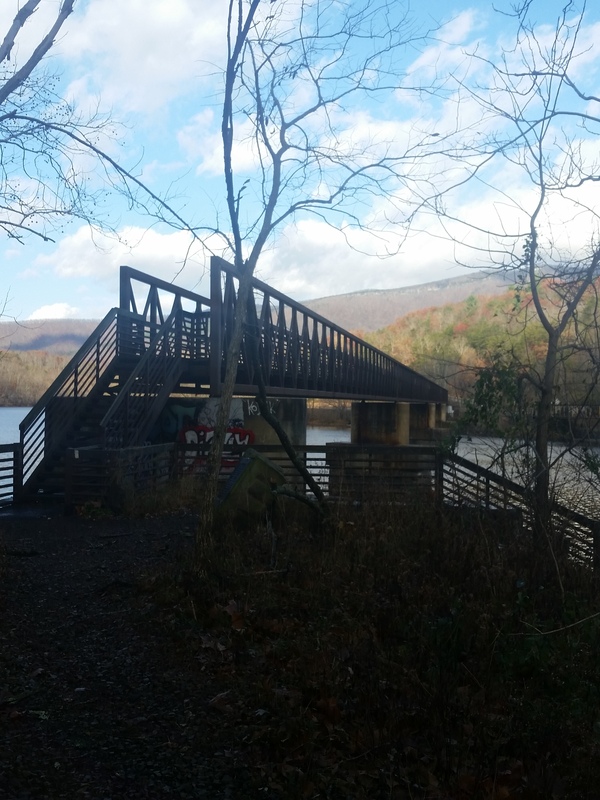 I descended through the dark, down, down, down until I found the wooden suspended bridge that crossed a small section of the Lynchburg Reservoir. Lights from a few houses lakeside beamed through the night. 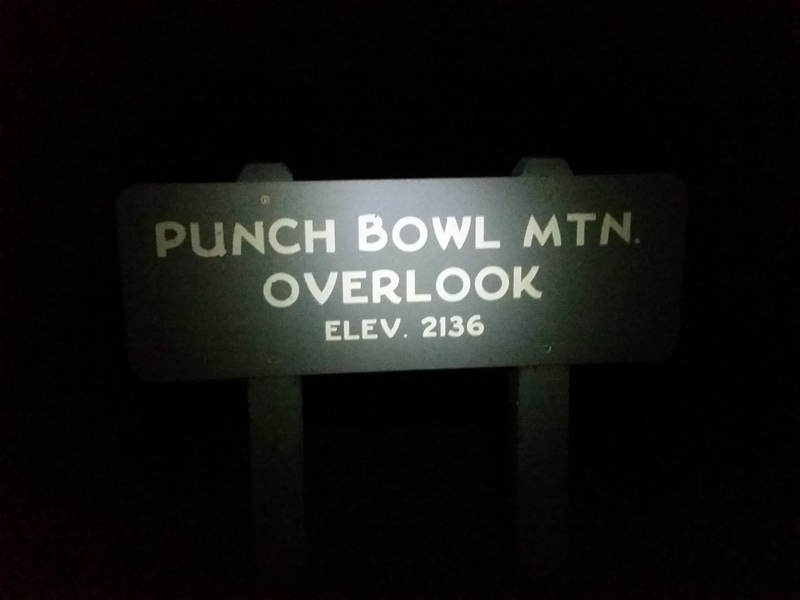 I trekked on, curious if the people knew there were hikers passing through the darkness nearby. That morning was particularly chilly; I had my facemask on fighting the chill back. As I started to ascend the next bit up, the sun rose and with it the wind, which made me question whether I should pull on my mid-layer. Hoping my body would generate enough heat from the climb I pressed on. I pushed up the long, windy, cold climb. This was one of those sections where you just have to put your head down and get to work. I didn’t miss much, most of the woods through here were twisted, lifeless, and a muddy brown. I finally hit the ridge, drenched in sweat. Without pause I got after the up down section until I finally broke from the woods and into the open fields of Cold Mountain. It was rightfully named! The wind whipped through this open section, but the expansive views were still worth hanging out for a while and snapping some pictures. I pressed on into the roller coaster section where you would go up a 600 ft climb, then right back down 700 feet, up, down, in canyons, out of canyons. At this point I was pretty tired from the miles, and the last few miles became mundane. A mile or so before my destination, I stopped next to a lush green moss area near a creek to refill my water (and my spirits) for the last push to the shelter. Soon after filtering, I finally reached the shelter and when I dropped my pack, a lot of the fatigue of the day went with it. 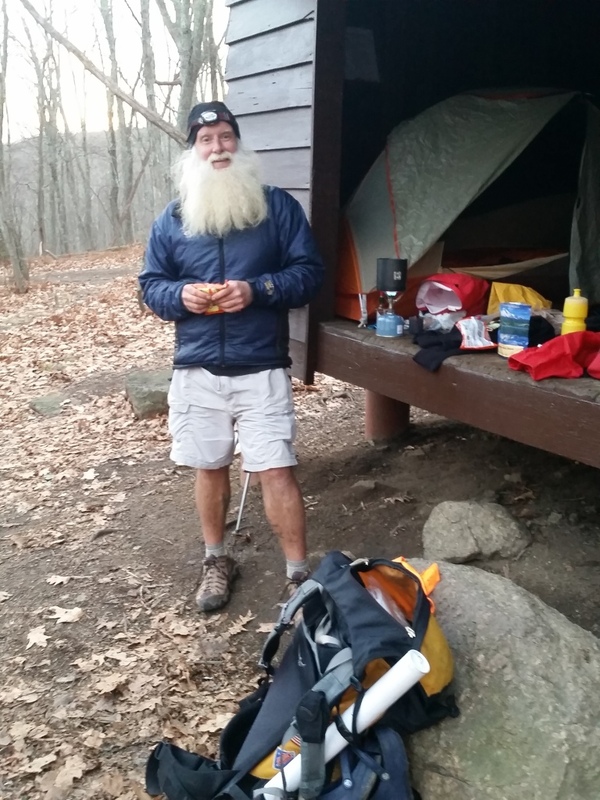 After setting up my tent, a south bound through hiker with a huge white beard named “Just Jim” pulled up to the shelter. He was given the trail name “Just Jim” by a friend because he wasn’t a big talker when he first started on the trail, and his name was Jim (not to be too cutesy). People would say “oh that’s Just Jim”, and it stuck. He was doing a YoYo (two through hikes in one year where you hike down the AT then back up) for the Disabled Veterans (if you’re interested in knowing more check out http://hike4veterans.com/). Everyone is out there for their own reasons, and this guy was out there for a good one! We chatted a bit about the coming snow, gear and food selection, and the trail before crashing out. Another awesome day on the trail! Apparently this red velvety flower thing is staghorn sumac, which according to Tom Termini, is awesome for making “Indian lemonade”. Thanks Tom for the info! Let the roller coaster begin! The third day was all about making miles and trying to stay dry. I planned on pushing 25 miles from Thunder Hill shelter to Punchbowl Shelter. If I failed to hit my mark I would be out of position to finish on time (another day on the trail would mean a need for food I did not have with me) and if I got wet, my down bag would be useless at night and I would have to bail or improvise. It had rained all through the night, and the subsequent fog hung around like a bad date, so I decided to throw on my rain gear and wear trail runners for at least the morning (trail runners are thin, light weight shoes that wont retain a lot of water if they get wet). I finished my morning ritual of cooking breakfast and packing up camp. I felt like I was getting the process down to a science when I strapped my pack on, ready to let out into the dark. The fog still weighed down so heavily that I could only see about 4-6 feet ahead of me, even with the aid of my headlamp. 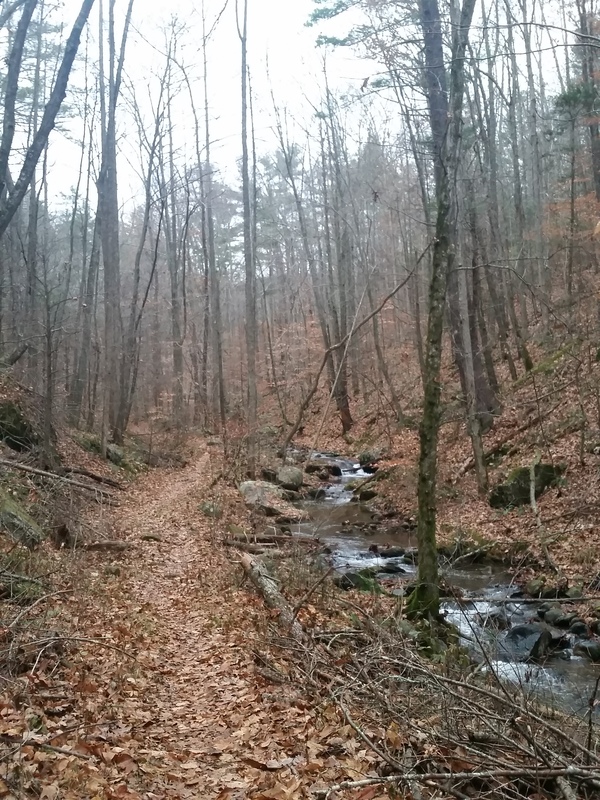 I trekked through the wet leaves covering the muddy trail downhill towards the James River, which would mark the half way point of my journey, the lowest elevation I would hit on trail, and my next filtering point! 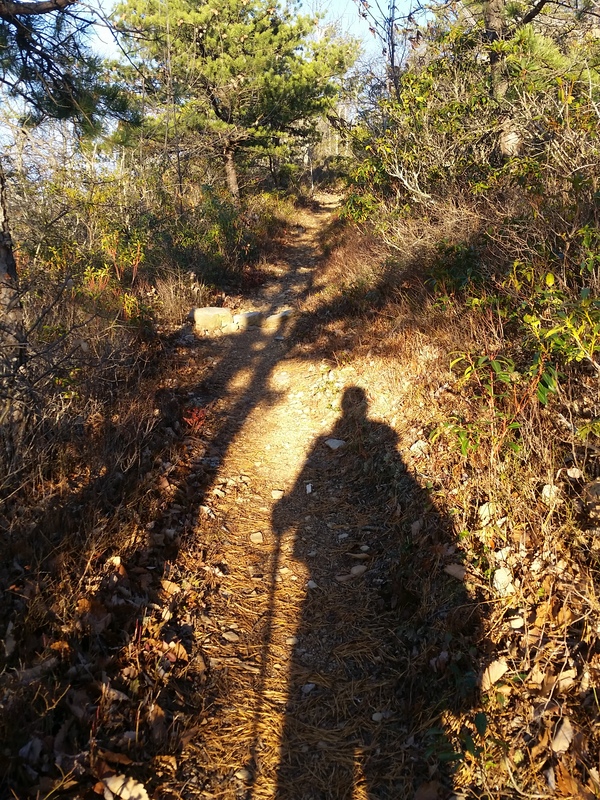 Wearing trail runners and trekking downhill through all the wet leaves on off camber rock, it wasn’t long before I had a misstep and twisted my ankle. Sharp pain went searing through my left leg and ankle, and this was only the first of three slips that would happen that day. Paranoid about my ankles, I treaded lightly and leaned heavy on my trekking poles, hoping for the best. I was lucky the first time; another misstep could spell disaster. The sun soon rose and the fog lifted, along with my spirits. Twisting trail finally gave way to my first views of the James River a few miles before Matt’s Creek Shelter. I was excited to touch the river and claim half my tremendous goal complete! This time of year, all the leaves have fallen and scattered across the trail, which give you opportunities to see the vast landscapes that surround the trail. However, some of my favorite views were of creek crossing where I got to see the moss, ferns, and low-level plant life thrive! It was such a contrast to the surrounding leafless, almost lifeless, trees. I finally reached the footbridge that spanned the river. Upon crossing, I took a quick snack break and the opportunity to remove my shoes and let them dry some from the morning’s wet walk. I was one happy fella at this point, but I knew I still had 11 miles and a big gain to conquer before the day was done. I finished my break, filtered water and got back to the grind. The next grade was one of those 800-1000 feet of gain within a mile that never seemed to end. Half way up, to my surprise, I came across an older couple (in their 70s) that were just “out for a short 6 miler”! This made me laugh a bit. I know some people half their age that wouldn’t want to even think about taking on this section of trail, and here these two were happier than a couple of pigs in a mud pit! I had a quick chat with them and kept on trekking. I finally reached the top of the ridge dripping in sweat. By this time the sun came out and it warmed up to the 60s, which seemed like an anomaly. My long sleeves and pants were all rolled back! I pressed on weaving back and forth, up and down, along the ridge until I peeked out on Bluff Mountain. This was the end of my climb and I was happy to find it! The last few miles I drug my tired body across the last miles and into the Punchbowl Shelter where I set up my tent, made a huge meal, and read 2 lines of my book before passing out like a rock. It was one good day. 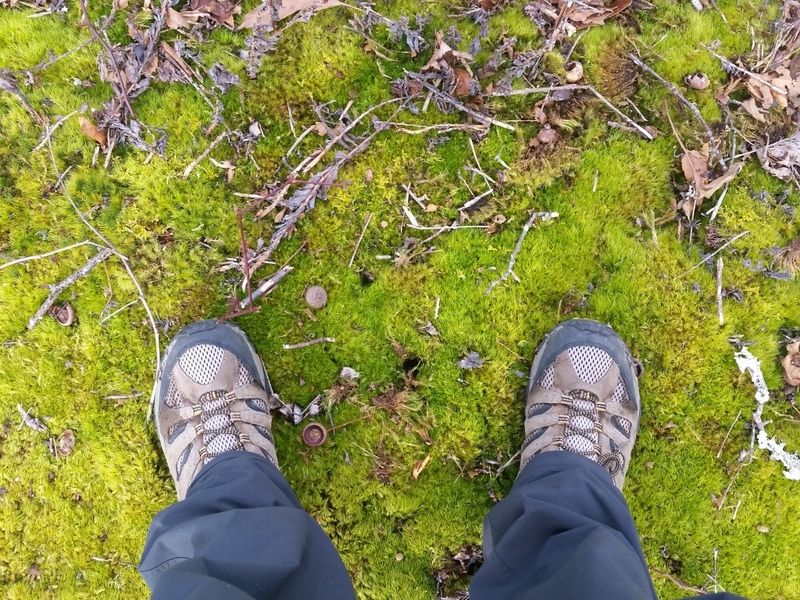 Oh I love the green moss! A little more work to do! 5.2 Miles to Bluff Mountain, my last climb for the day! The second day, I woke and started moving with a purpose: to outrun the rain that was on the way! I had been checking the weather like it was my favorite t.v. show the week leading up to the trip and I knew the second day was going to have thunderstorms in the afternoon lasting through the night. I had 16 miles to cover and the bad weather was supposed to roll in about 2pm. I woke up, made breakfast, packed up my gear and sipped down my last bit of coffee as I let out onto the trail in the dark. I trekked a few miles by headlamp, downhill to Jennings Springs where I filtered water for the day ahead of me. The morning was chilly and filtering the cold water was a chore in and of itself! Once complete I started the uphill battle towards Thunder Hill about 3000 feet above my current elevation. I had some work to do! The sun slowly rose but never peaked through the overcast morning protecting the cool canyons where the creeks trickled through. On one such creek crossing I stumbled upon Bryant Ridge shelter, this was well built sizeable double decker was meant to house 20 people! I took a quick break here before pushing on through the woods to my next stop. 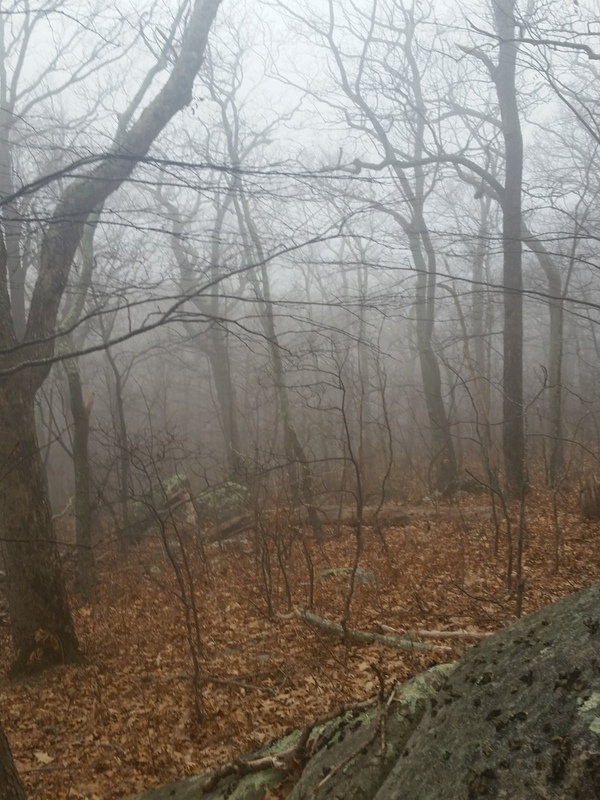 As I trekked upwards towards ridge where I planned to camp a creepy fog rolled in. I knew this was the precursor to the thunderstorms which were marching towards me. The low lying cloud engulfed the twisted woods around me and reminded me of a scene out of sleepy hollow. To add to the fun I walked past a tree that had been freshly stripped of bark from about 9 feet up to the base. There was no mistaking that this was bear sign. Only thing I could do was keep trekking. It started to sprinkle just a mile before my destination, I quickly threw on my rain jacket and pack cover and pushed through the fog. I finally reached the empty shelter and set up camp, filtered more water, and got into my tent ready to read the rest of the rainy afternoon. Just as I went to zip the tent closed a cold wet nose came sniffing my hand! To my relief it was a German shepherd named Chaos (and not a bear). A southbound through hiker and his dog “Chaos and Company” had just arrived to seek haven in the shelter from the rain. They had started hiking in Pennsylvania for a short 4 day trip which turned into a 2 month excursion after they decided just to stay on trail. They were a funny crew: he told me about only treating AT water with bleach, special all natural dog food for Chaos, his homemade couscous StoveTop Ramen meals, and his weakness for coffee (guy had a full bag of sugar and creamer, obviously lot too concerned with weight). It always amazing the people you meet out on the trial! I finished a few pages of my book and passed out to the sound of rain on the shelter roof. Oh the Moss and the Fog, what a combo! Bear sign, not cool, man it looks fresh! 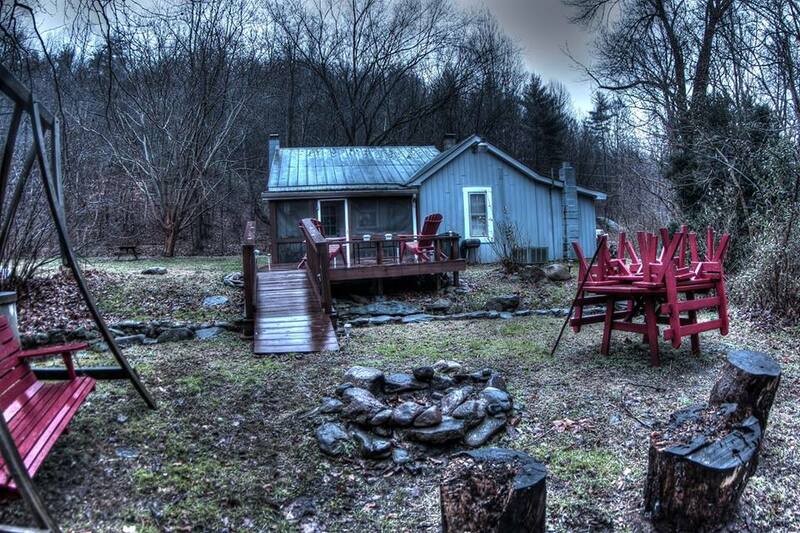 The first day, my sister dropped me at the trail head just off Interstate 81 north of Roanoke, Virginia. 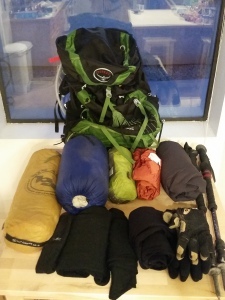 It was 19 degrees F and my pack was bulging from 5 days of food, 6 liters of water, inclement weather clothes, and the other basic backpacking essentials: stove, sleeping bag/pad, and a tent. I said my goodbyes, strapped on the beast of a backpack and headed up the trail. After only a few tenths of a mile up a decent grade, under the weight of my pack, I started thinking about why I was even on this trail to begin with. 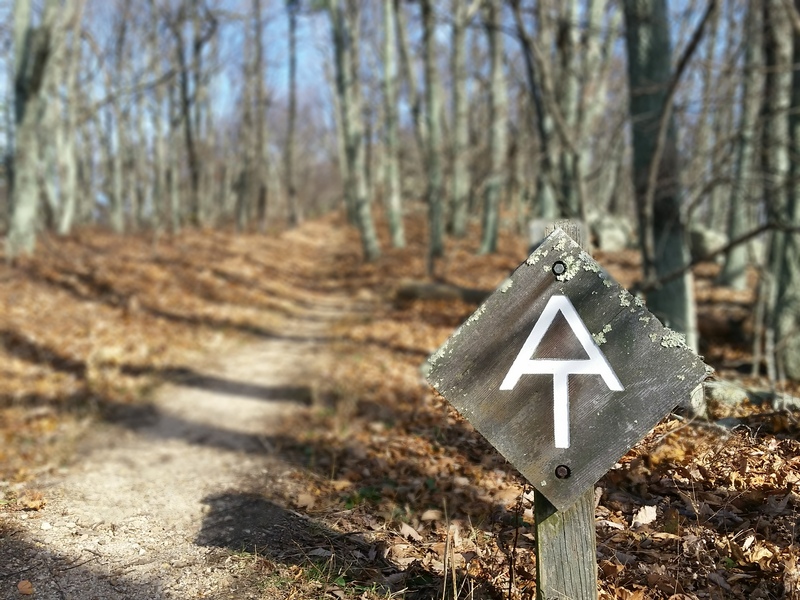 I had been planning this Appalachian Trail section hike for some time, it was mainly to test myself and see if I could push a 5-day, unsupported backpacking trek into less than perfect weather and come out on the other side smiling. Completing this trek would tell me if I am capable of going after the PCT (Pacific Crest Trail), a 2650 mile trail from Mexico to Canada crossing California, Oregon, and Washington. Let the test begin! I pushed through the first small wooded section, passing through a gate that opened into a cow pasture. I look up to see a group of 1 ton beasts standing around, a few milking small calves. I decided it was best to circumvent these guys and made a large sweeping left around the grazing group. Trekking along, I passed through a few private sections of land before getting back into the woods. Plenty of big gain trail padded with fallen brown leaves. About 2 hours into the trek, I came across a sign that said I had only traveled 3.3 miles. My heart sunk. At this rate I would be hiking into dark in attempts to cover the 22 miles I had planned on completing that day. I decided to dump about a liter of water (due to how little I was drinking in the cold weather) and pressed on. 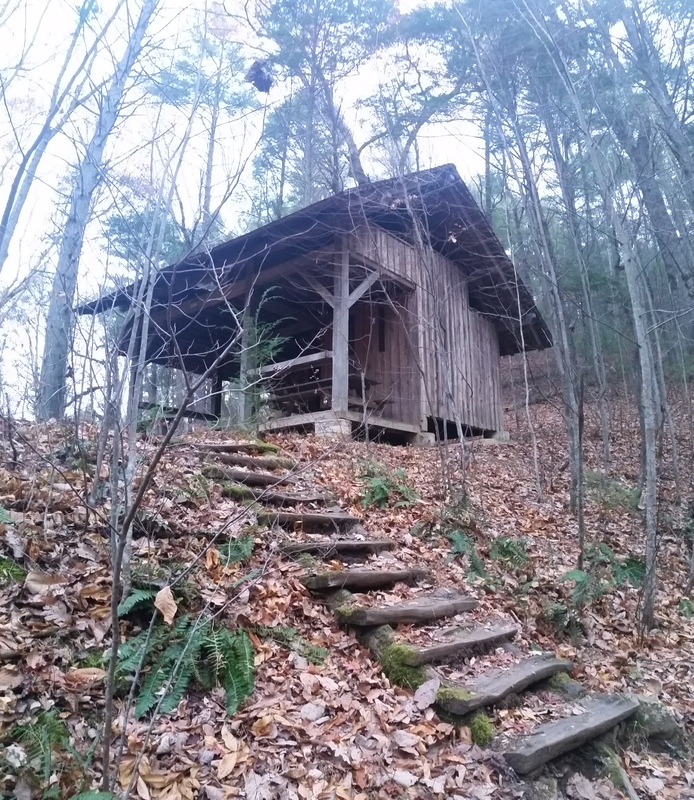 After making some good progress, I came across the first of many 3 sided shelters on the trail. 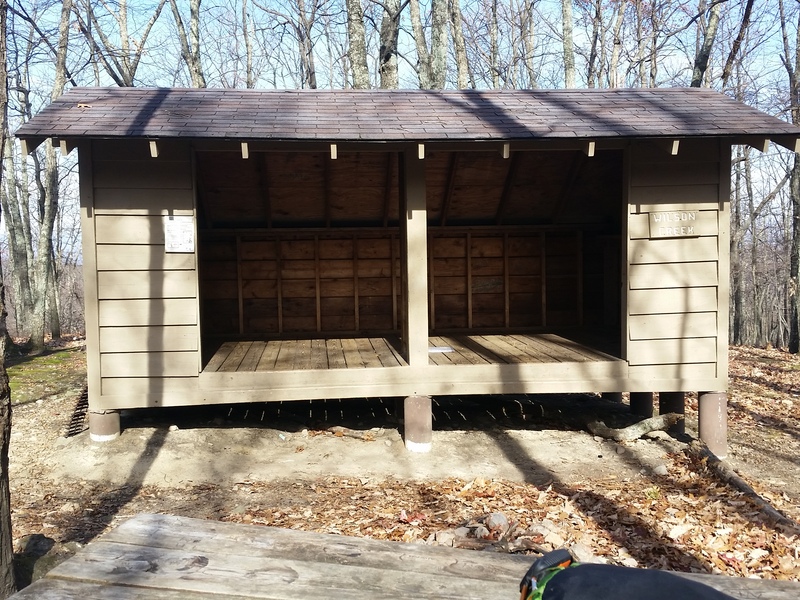 The Appalachian Trail has shelters set up for through hikers with (sometimes) nicely built outhouses just a short walk away. These things were like having a Hilton on the trail! 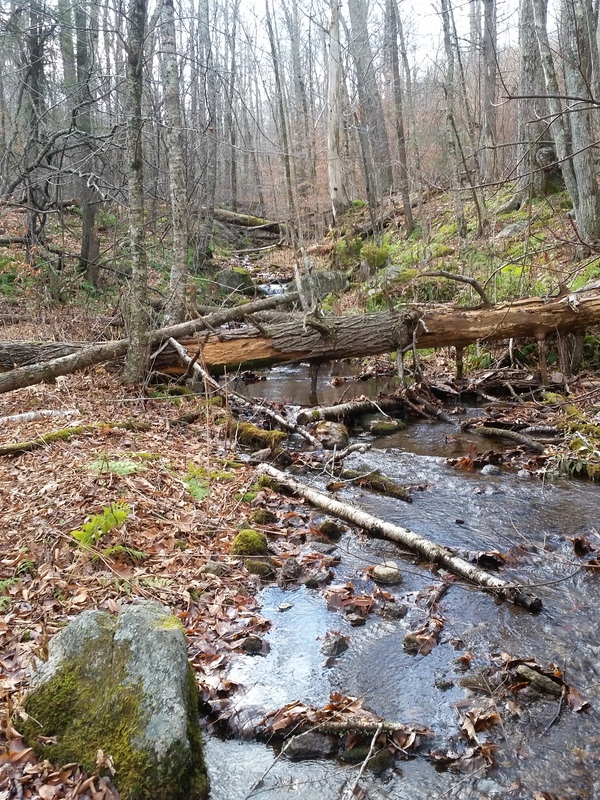 I kept trekking through the woods until I found the first of a few Blue Ridge Parkway crossings, where over the next few miles the trail crisscrossed a scenic road through the mountain. At one of these crossings, where I stopped for a quick break, I met Corinna and Wil. 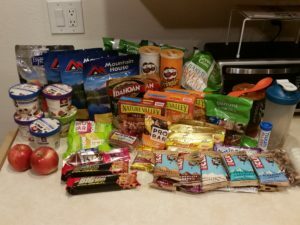 They were from Seattle and were just traveling around, stopping and chatting with/helping through hikers while offering hot tea, food, water…whatever the hikers may need. They were a very cool couple, I chatted with them for a bit about all the places they had traveled and where they planned on going. Regular drifters, living in different areas in different times of the year, they were collecting retirement and enjoying their house on wheels seeing all the country had to offer. Really good people! I pressed on knowing the mileage I had to cover wouldn’t just melt away like time, and I still had some work to do before night fall! 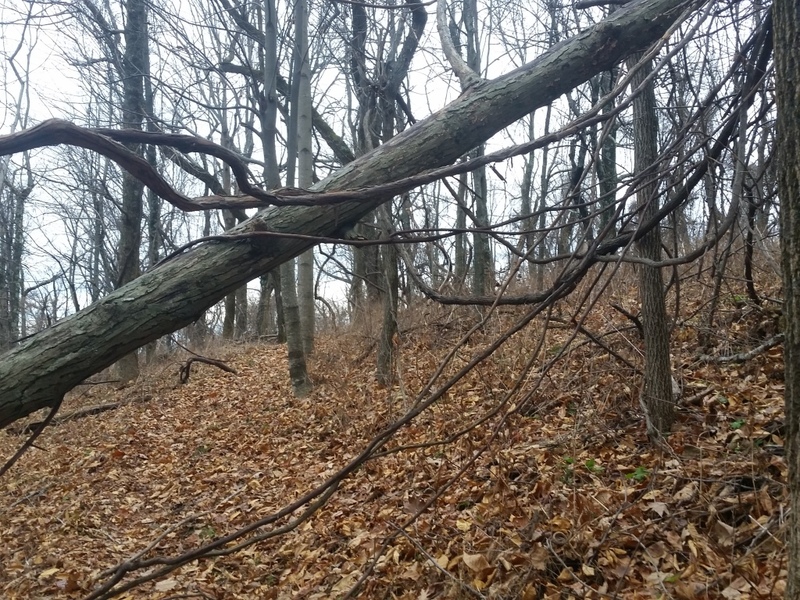 The trail would duck into wooded areas where you could see nothing of the surrounding area, then randomly open up to see a segment of the surrounding mountains before closing back up and engulfing you in trees and shrub. I watched the sunset in the distance as I pressed through the last mile. The colors were incredible! 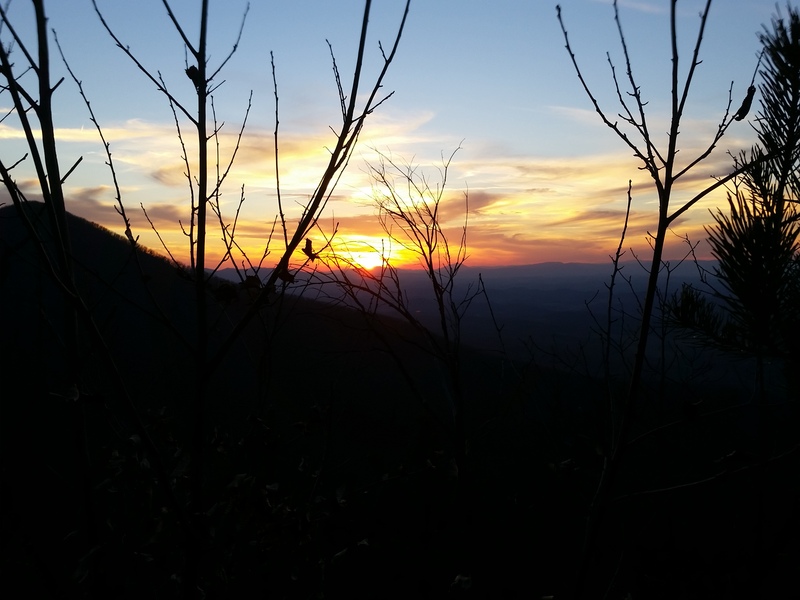 The Blue Ridge sunset had deep blues and purples you don’t get back in Arizona. 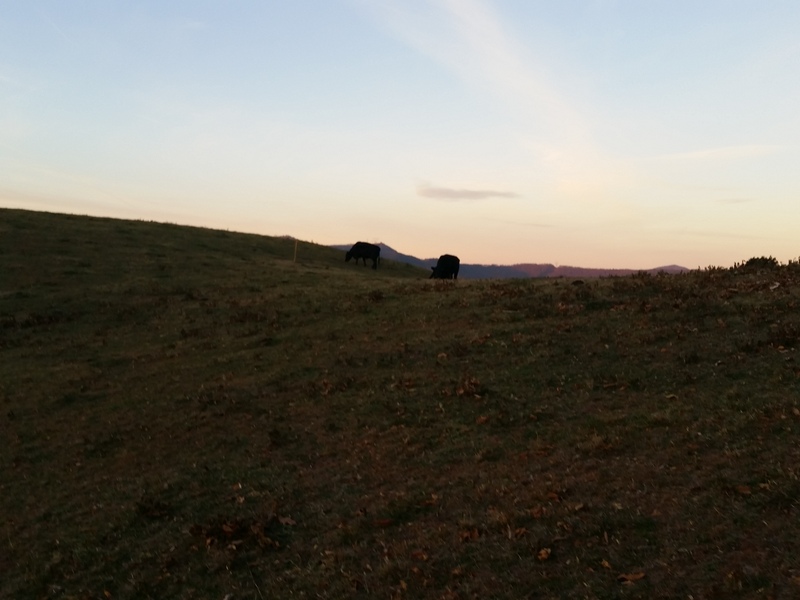 I really enjoyed seeing the red rolling hills in the distance and all the little house/cabin porch lights pop on as the night fell on the mountains. I reached the Cove Mountain shelter exhausted. I set up my tent, cooked dinner, and before I knew it, I was sound asleep in my sleeping bag, oblivious to the sounds of the woods around me. With the first day in the bag I slept like a baby, needless to say I was tired! Cove Mountain here I come!